What does a mom do when her kids LOVE waffles? My kids will eat waffles in the morning and then ask to eat them again at lunch. Well, I love a good waffle every now and then, but a mama’s gotta get her kids to eat some variety! Well, if you’re like me, you get creative. And then creative leads to some tinkering in the kitchen. And then, next thing you know, voila’! 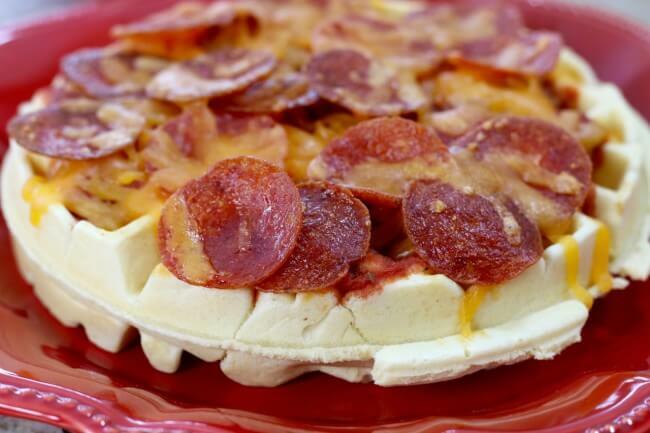 You have a new easy recipe for Waffle Pizza. 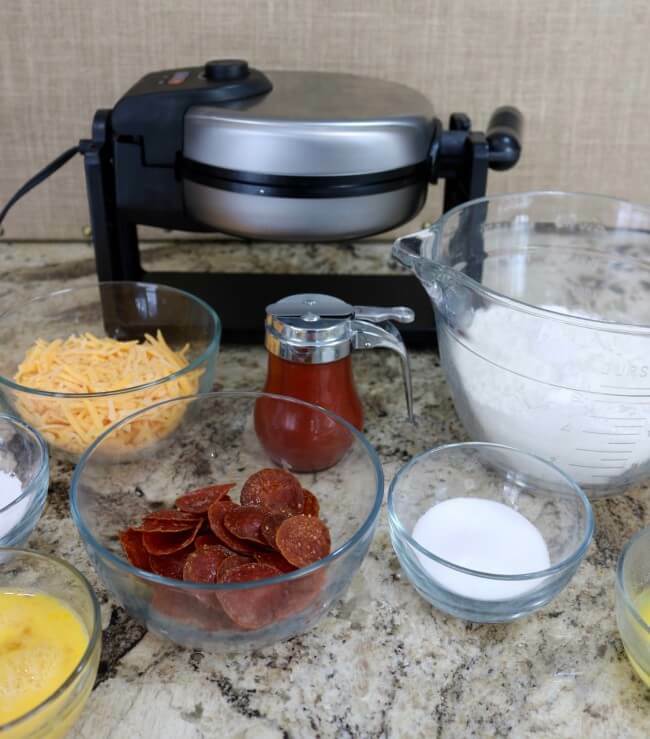 NOW my kids can search the nooks and crannies of a waffle… to find yummy goodies like melted cheese, pepperoni and pizza sauce. Plus, one of my favorite things about this recipe, to make it work taste-wise, you cut back on the sugar. Yeah! I reduced the sugar by 50% from my normal waffle recipe but with all the yummy toppings my kids did not notice it. Hooray! Waffles with less sugar and more protein equals SUCCESS. Score one for mom and everyone is happy. 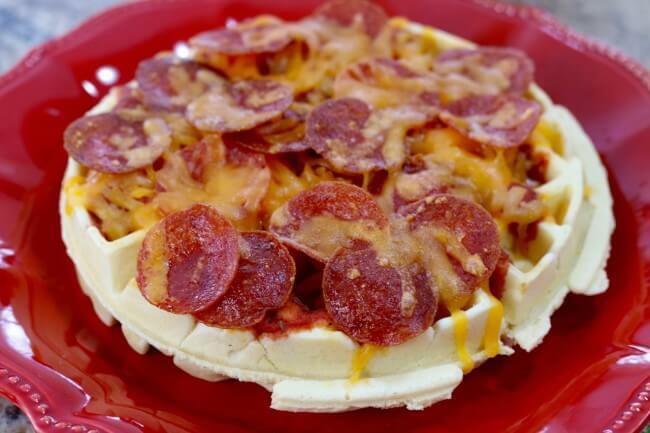 This 30 second video you walk you through the creation of this tasty Waffle Pizza. 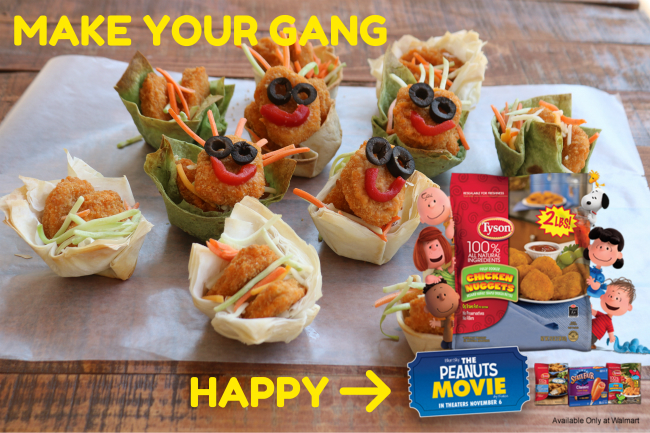 Subscribe to my YouTube channel for more fun easy recipes and kids’ activities. 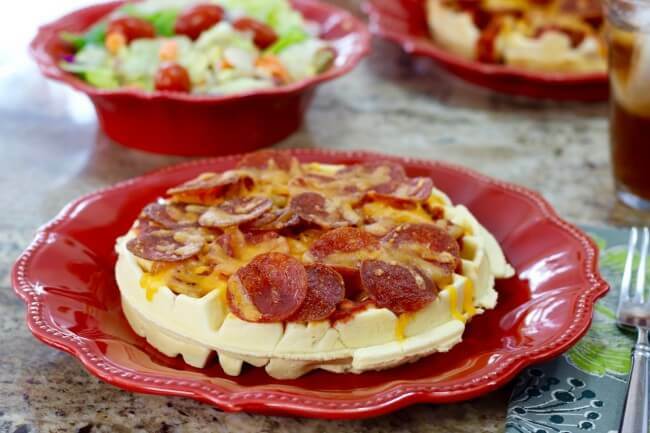 I hope you enjoy this new easy Waffle Pizza recipe! Step 1: Preheat a Belgium Waffle Iron. Step 2: Mix the ingredients. Combine all the dry ingredients first and mix throughly. Add the butter and eggs and combine. Add the milk slowly until you achieve the desired thickness. The mix will seem a bit rubbery. Keep mixing until smooth and until the dough rolls off of a spoon easily but not too thin (be careful it’s not watery). My dough was thick – not as thick as peanut butter, closer to a squeezable mayonnaise, but not as thin as soup either. Step 3: Spray the waffle iron with non-stick spray. Pour the waffle mix onto the waffle iron. You’ll pour the waffle mix onto the center of the waffle iron and use a spatula or soon to spread it. The mix expands considerably due to the baking powder so do not overfill. Just spread it to cover approx. 3/4 of the circumference of the waffle iron and the expansion should take care of the rest. You may have to test one to see how your batter works. Step 4: Cook the waffle. Once you for in the mix, close the lid and rotate the waffle iron. This will help distribute the batter and ensure The waffle iron has an automatic timer. Familiarize yourself with how your waffle iron works. Some use a sound to signify cooking is complete, others use a light. Keep an eye on the waffle iron to make sure you do not overcook or undercook your waffle. My waffle was complete in about 6-7 minutes. Step 5: Add your toppings to create Waffle Pizza. I topped our Waffle Pizza with marinara sauce, pepperoni and cheese. I precooked the pepperonis in a pan to make sure they were crispy (the way our family likes them). You can customize the pizza any way you like. Try Hawaiian style, or three-cheese, or meat-lovers. With all the little pockets there’s room for loads of veggies, meats and cheeses. Step 6: Broil the Waffle Pizza Set your oven to broil and broil your Waffle Pizza about 6-8 inches from the top of the oven for approximately 3 minutes to melt the cheese and brown the top. Ovens vary so make sure to keep an eye on things so you don’t burn your Waffle Pizza. What’s your favorite way to eat pizza? 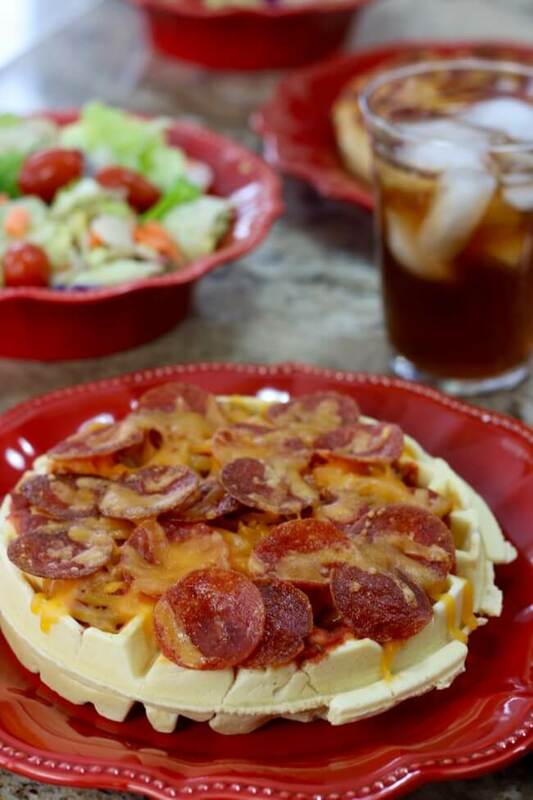 Do your kids love waffles and pizza? How do you top a pizza in new and fun ways? You could top this one with not just traditional pizza toppings but with peanut butter and jelly, ham and cheese or any variety of traditional pizza or sandwich toppings. 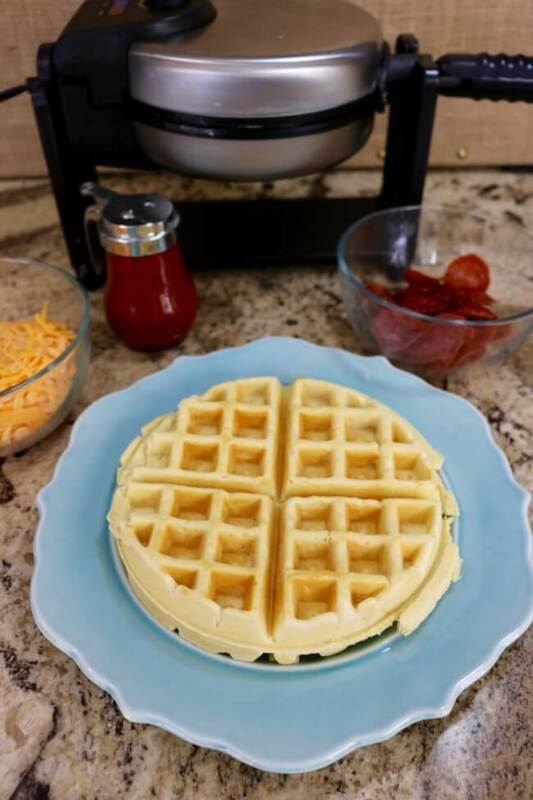 Does this easy recipe give you new uses for your waffle iron? Please share a recipe idea or leave a comment below and join the conversation. I always love hearing from my readers! Thanks for being a fan! Do you have a board for delicious recipes or easy meals on Pinterest? Help spread the word and PIN this post on Pinterest!